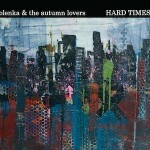 Hard Times is Olenka Krakus’s fifth album released last October. Produced by multi-instrumentalist band member, Simon Larochette, and mixed by Dan Weston (Paper Lions, Grey Kingdom, City and Colour), the album’s sound seems fuller and more matured. Olenka’s voice is paired with lyrics which may seem delicate and beautiful but underlying them is a darker narrative that evokes nostalgia for the her old country, Poland, and explores themes of foreigness, loneliness, and the unknown, in both foreign and familiar landscapes. Sung by a warm and comforting voice, the songs seem to be made to be listened to with a cup of tea by a living room fire or with a glass of whiskey in a musty bar. This album can be perfectly described by the band’s name. It is really for autumn lovers. Olenka & the Autumn Lovers are participating in this year’s NXNE and you can catch them at the Rivoli on 23 June as a part of the Box Salon Series.